The Samsung Galaxy On7 SM-G600FY manual very important because provide many reference or tutorial for example how to using this phone with correctly. This manual provide information such as Device layout and features, tutorial Installing the battery, tutorial Installing the SIM or USIM card, Installing a memory card and formatting, using touchscreen, home screen and lock screen. Pressing the Power key turns off the screen and locks it. Also, the screen turns off and automatically locks if the device is not used for a specified period. 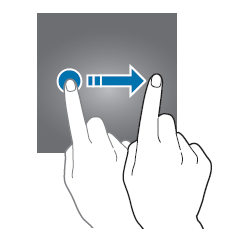 To unlock the screen, press the Power key or the Home key and swipe in any direction. Then about Using the notification panel, Screen capture, Device and data management, Installing or uninstalling apps, using contacts and importing, using messages, using internet for searching information, using email, camera for taking photo, gallery, smart manager, video recorder, s Planner, radio, google maps and more. How to Importing contacts in Samsung Galaxy On7?Import contacts from storage services to your device. On the Apps screen, tap Contacts → MORE → Settings → Import/Export contacts → IMPORT and select an import option. Other important information in the Samsung Galaxy On7 user guide / manual such as about phone settings guide like Connecting to a Wi-Fi network, Pairing with other Bluetooth devices, Flight mode, Mobile hotspot and tethering, SIM card manager, Lock screen and security, Registering Samsung accounts, Reset and restore guide, and troubleshooting. Change the settings for managing settings and data.On the Settings screen, tap Reset. Back up my data: Set the device to back up settings and app data to the Google server. Automatic restore: Set the device to automatically restore settings and app data from the Google server when apps are reinstalled. If your device freezes or hangs, you may need to close apps or turn off the device and turn it on again. If your device is frozen and unresponsive, press and hold the Power key and the Volume key down simultaneously for more than 7 seconds to restart it. If this does not solve the problem, perform a factory data reset. On the Apps screen, tap Settings → Reset → Factory data reset → RESET DEVICE → ERASE EVERYTHING. Before performing the factory data reset, remember to make backup copies of all important data stored in the device. If the problem is still not resolved, contact a Samsung Service Centre.